We may not be able to add more hours to our day or more nice days to summer, but now, we can add more digits to our hands. MIT researchers have recently developed a system that allows even five-fingered folks to up their dexterity...with a little help from robotics. Created by researcher Faye Wu, the "SR" or "supernumerary robotic" fingers are controlled by glove-embedded sensors which apply the same amount of grip and force as the rest of your hand. The possibilities are intriguing...from folding laundry faster to executing literally unheard-of piano solos. And the practical uses for those who need a little extra everyday help are diverse and ever-expanding. As Wu said in a video interview posted on gizmodo.com, "The fingers are quite long, so the user can grab things that are usually much larger or much heavier than they can do with a single hand. 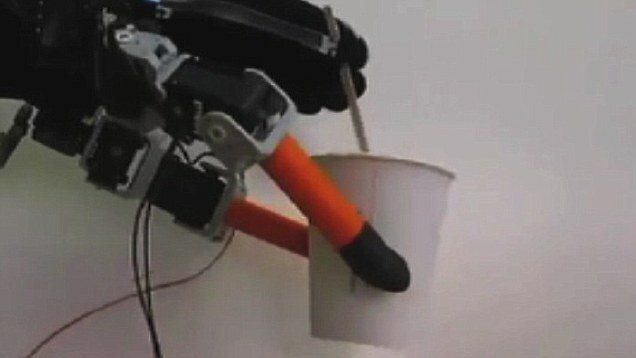 With the assistance of the SR fingers, users can grasp objects that are too difficult for them to do with a single hand. For example, objects that are too large, too heavy, or the surface of the object is too hot or too cold. You can also perform tasks that usually require two hands, for example, a single hand taking a cap off of a bottle, or opening a letter. For elderly, or people with disabilities, these fingers can help them enjoy a living much more independently." High five...no, high SEVEN to the researchers who continue to develop this project. This is how the robot baristas are going to take over.